Pretty and feative Christmas tree pin. 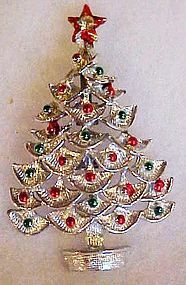 Shiny silver tone metal filigree tree with enamel accents on the ornaments andstar. Star has a sparkling rhinestone center. Measures 2 1/4" tall and is in beautiful condition, and ready to wear.